What exactly IS God's true work today? Before discussing the overview of what the work of God is today, it is important to discuss what God’s work is NOT. God’s work is NOT Matthew 24:14 or to “preach the gospel to the world as a witness”. 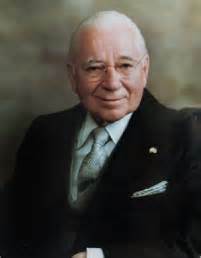 This commission was given to Mr. Herbert W Armstrong and was fulfilled completely by him. Matt. 24:14 is therefore fulfilled prophecy. This has been repeatedly and clearly documented here on the Church of God website via articles and sermons for many years. To warn the people of God (God’s Church or people) that time is running out and that the great tribulation is rapidly approaching. This entails preaching the true gospel again TO GOD’S PEOPLE because the vast majority have departed from that gospel or God’s way of life. The Church or people of God are the ONLY ones under judgment NOW and therefore are the ONLY ones who are in danger of losing their eternal lives. (I Peter 4:17) It is a dire and urgent warning. To warn the nations of Israel that the time of Jacob’s Trouble is imminent. (Jer. 30:7) This entails the same Ezekiel warning message as given by God’s end-time apostle, Mr. Herbert W Armstrong. (Ezek.6, Ezek.33, Deut. 28, etc.) These prophecies of Ezekiel as well as the New Testament prophecies will soon come to fruition as the great tribulation (Jacob’s Trouble) comes primarily first upon the United States and Great Britain and the other modern nations of Israel. As a result of these warnings to primarily spiritual Israel (the Church) and physical Israel (the modern nations of Israel), the warning also applies to any or all of mankind who will listen and heed (repent). See Jer. 6:16-19. The warning from the Church of God website reaches literally every nation on earth. There is no mandate or commission to preach the gospel to the world as a witness today (as stated earlier), however the true gospel message is all in and through the Church website, and many nations are taking notice. For example, out of the over three quarters of a million hits on the Church website, ONLY 17% of those hits are from North America (U.S. & Canada). The vast majority of website hits are actually coming from gentile (non-Israelite) nations! We believe that even now God is beginning to prepare the “great multitude” mentioned in Rev. 7:9. To feed the flock or Body of Christ. This is done primarily through the vast database of knowledge contained on the Church of God website, via weekly sermons and articles and the vast amount of digitally preserved writings from God’s end-time apostle. Ultimately though the “feeding” comes through Jesus Christ and through His inspiration. The basis of this feeding of the Body of Christ is on God’s Word (Jesus Christ in print) as revealed and taught through Christ’s chosen end-time apostle, Mr. Herbert W Armstrong. This knowledge of God’s true way can be summed up in the very name of the Church of God website which is “Hold Fast To All Things” which is a composite of Matt. 17:11 and Rev. 3:11. When these scriptures are fully understood spiritually, they form a summary of the basis for the teachings of God’s true Church today. It all has to do with remembering what we as God’s people were taught from the beginning under the leadership of God’s apostle (Mr. Armstrong). The purpose then of this spiritual feeding is to help prepare the Bride of Christ! (Col. 1:21-23, Eph. 5:27, Rev. 19:7) This is our ultimate goal as we “seek first” the Kingdom of God. This again, is just a summary or overview of God’s true work today. Each of the four points above are covered in great detail within the various articles and sermons on this website. If you are interested in returning to (or learning) the Plain Truth of God, take a look at the “Local Congregations” page on this website.